By now, you may have already heard the latest tale of gloom and doom surrounding the upcoming series of lunar eclipses. This latest “End of the World of the Week” comes to us in what’s being termed as a “Blood Moon,” and it’s an internet meme that’s elicited enough questions from friends, family and random people on Twitter that it merits addressing from an astronomical perspective. Like the hysteria surrounding the supposed Mayan prophecy back in 2012 and Comet ISON last year, the purveyors of Blood Moon lunacy offer a pretty mixed and often contradictory bag when it comes down to actually what will occur. But just like during the Mayan apocalypse nonsense, you didn’t have to tally up just how many Piktuns are in a Baktun to smell a rat. December 21st 2012 came and went, the galactic core roughly aligned with the solstice — just like it does every year — and the end of the world types slithered back into their holes to look for something else produce more dubious YouTube videos about. Here’s the gist of what’s got some folks wound up about the upcoming cycle of eclipses. The April 15th total lunar eclipse is the first in series of four total eclipses spanning back-to-back years, known as a tetrad. There are eight tetrads in the 21st century: if you observed the set total lunar eclipses back in 2003 and 2004, you saw the first tetrad of the 21st century. Whoa, some scary allegory, indeed… but does this mean the end of the world is nigh? I wouldn’t charge that credit card through the roof just yet. Furthermore, Passover is always marked by a Full Moon, and a lunar eclipse always coincides with a Full Moon by definition, meaning it cannot occur at any other phase. The Jewish calendar is a luni-solar based calendar that attempts to mark the passage of astronomical time via the apparent course that the Sun and the Moon tracks through the sky. The Muslim calendar is an example of a strictly lunar calendar, and our western Gregorian calendar is an example of a straight up solar one. The Full Moon marking Passover often, though not always, coincides with the Paschal Moon heralding Easter. And for that matter, Passover actually starts at sunset the evening prior in 2014 on April 14th. Easter is reckoned as the Sunday after the Full Moon falling after March 21st which is the date the Catholic Church fixes as the vernal equinox, though in this current decade, it falls on March 20th. Easter can therefore fall anywhere from March 22nd to April 25th, and in 2014 falls on the late-ish side, on April 20th. Note that over a five millennium span from 1999 BC to 3000 AD, the max number of eclipse tetrads that any century can have is 8, which occurs this century and last happened in the 9th century AD. Of course, the visual appearance of a “Blood of the Moon” that’s possibly alluded to in Revelation is a real phenomena that you can see next week from North and South America as the Moon enters into the dark umbra or core of the shadow of the Earth. But this occurs during every total lunar eclipse, and the redness of the Moon is simply due to the scattering of sunlight through the Earth’s atmosphere. Incidentally, this redness can vary considerably due to the amount of dust, ash, and particulate aerosols aloft in the Earth’s atmosphere, resulting in anything from a bright cherry red eclipse during totality to an eclipsed Moon almost disappearing from view altogether… but it’s well understood by science and not at all supernatural. 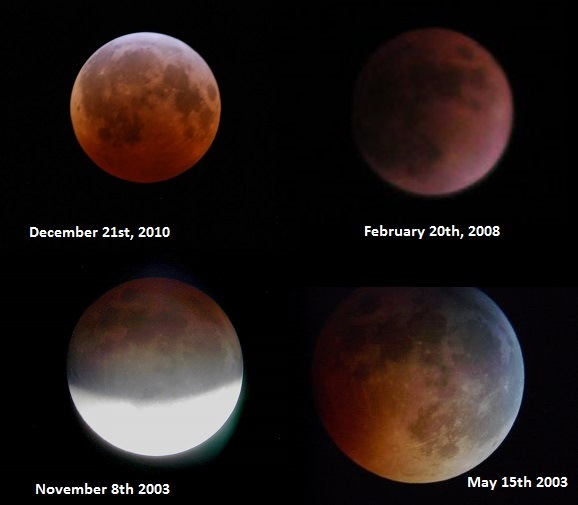 The changing colors of a lunar eclipse: a mosaic of four eclipses. Photos by author. Curiously, the Revelation passage could be read to mean a total solar eclipse as well, though both can never happen on the same day. Lunar and solar eclipses occur in pairs two weeks apart at Full and New Moon phases when the nodes of the Moon’s ecliptic crossing comes into alignment with the Sun — known as a syzygy, an ultimate triple word score in Scrabble, by the way — and this eclipse season sees a non-central annular eclipse following the April 15th eclipse on April 29th. So, what’s the harm in believing in a little gloom and doom? The harm in believing the world ends tomorrow comes when we fail to plan for still being here the day after. The harm comes when something like the Heavens Gate mass suicide goes down. We are indeed linked to the universe, but not in the mundane and trivial way that astrologers and doomsdayers would have you believe. Science shows us where we came from and where we might be headed. We’ve already fielded queries from folks asking if it’s safe (!) to stare at the Blood Moon during the eclipse, and the answer is yes… don’t give in to superstition and miss out on this spectacular show of nature because of some internet nonsense. The upcoming lunar eclipse next week won’t mean the end of the world for anyone, except, perhaps, NASA’s LADEE spacecraft… be sure not to miss it! CategoriesAstronomy, Eclipses, History, Moon, Observing, Skywatching Tagsapril 15 2014 total lunar eclipse, blood moon, blood moon pseudoscience, easter 2014, eclipse ladee, eclipse science, eclipse tetrad, Paschal Moon, Passover 2014, Total Lunar Eclipse, What is a blood moon?, when is the next total lunar eclipse? idk mang. bible haz changed on me a couple times. right before my eyez, so in my opinion, these patterns we see where there are none might actually be there. if you read the bible with a scientific mind it all makes allot of sense. to me the question is not are we alone, it’s are we on our own. I’m hoping your reference to Rev 6:12 was just an oversight where you called it Revelations. Everywhere else you referred to it correctly as Revelation. Sorry, but it’s a pet peeve of mine and usually reflects an unfamiliarity with the Bible. I fully agree with the rest of your article. Then again lots of typos get in, as in the link for the eclipse where apparently NASA refers to the eclipse of April 15, 2105. Don’t think I’ll be here for that one, if there is one. The circumstances for the April 15th, 2105 eclipse. The top chart shows the path of the Moon through the umbra, and the bottom chart shows the visibility region (light to shaded areas) Click here for a technical description. Credit: Eclipse Predictions by Fred Espenak, NASA/GSFC. Thanks, good catch… hey, we got it right 2 out of 3 times… its like Daylight Saving(s) Time vs Daylight Saving Time, it just sounds right, though its wrong. Our eyes crossed after counting tetrads by century.